How did the app come to my attention? 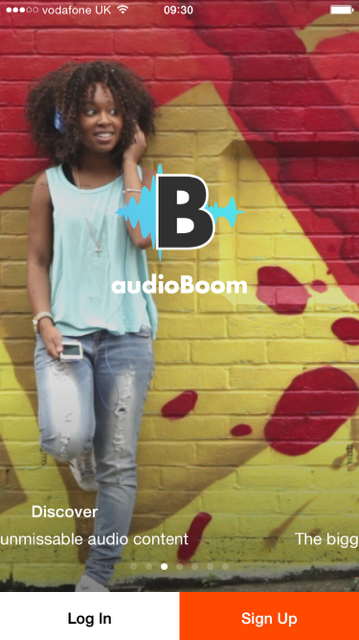 – I think it must have been one of my colleagues in the digital music space who mentioned audioBoom to me. My quick summary of the app (before using it) – I expect a platform which both enables people to upload their audio recordings and provides easy access to these recordings. Getting started, what’s the process like (sign up and choose a category)? – I’m not looking to record anything at this stage, I’m just looking to discover new podcasts to listen to. 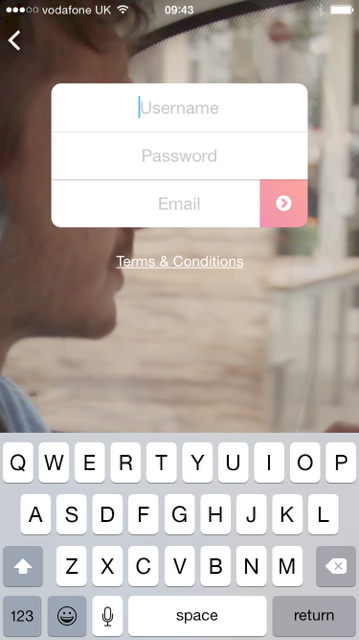 The signup screen and related steps are very straightforward. The second screen of the onboarding looks great and again, feels very intuitive; I can select the categories that I’m interested in (see Fig. 3 below). The overlay message explains this in two easy to understand messages (see Fig. 3 below) after which I tick the categories that I’m interested in. Getting started, what’s the process like (choose a subcategory)? – Per category that I’ve selected, I then get to choose a subcategory. 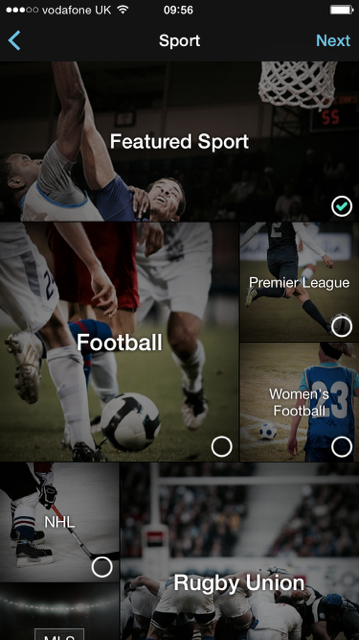 For example, for the “Sport” categories I can choose from subcategories such as “Football”, “Rugby Union” and “NHL” (see Fig. 4 below). Once I’ve gone through the different subcategories, I’m then presented with “Recommended Follows” (see Fig. 5 below). How easy to use was the app? 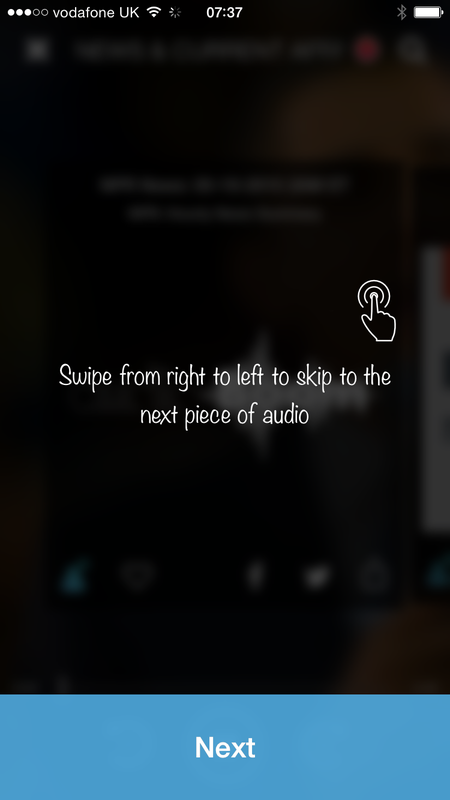 – Once I completed the onboarding process, the app explains how to navigate between different pieces of audio (see Fig. 6 below) and how to follow a specific user or to download audio for later. When you get into an actual piece of audio, the interface is clean but has all the info and calls to action necessary to listen to the audio (see Fig. 7 below). 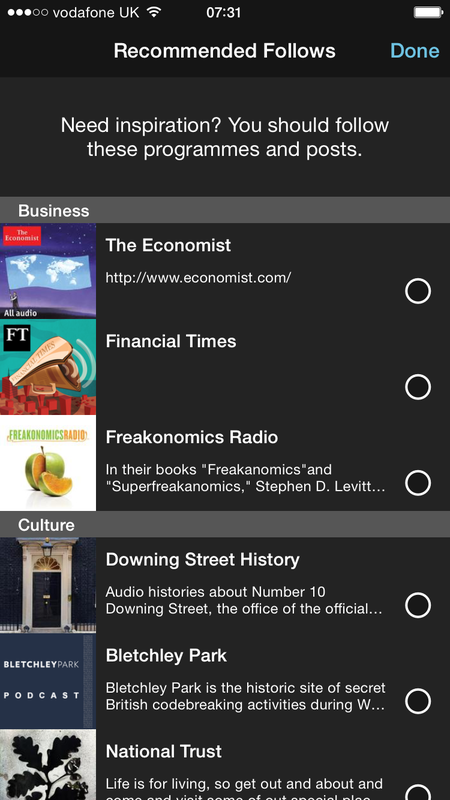 Navigating between the different pieces of audio on audioBoom felt very easy and intuitive. How does the app compare to similar apps? 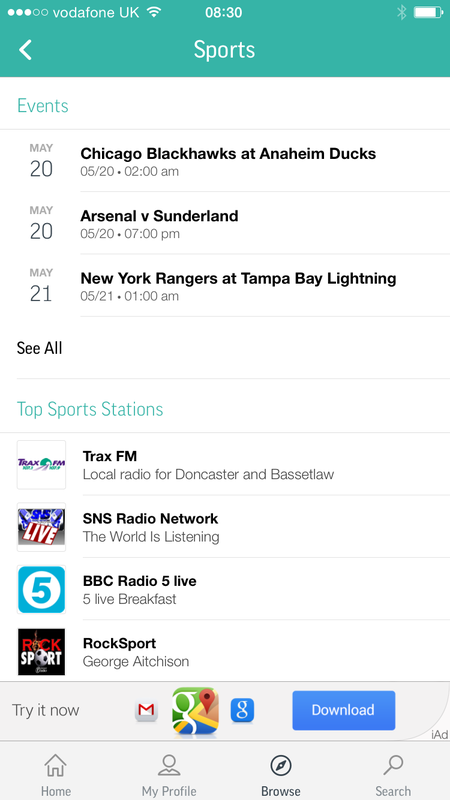 – TuneIn Radio is one of audioBoom’s main competitors. 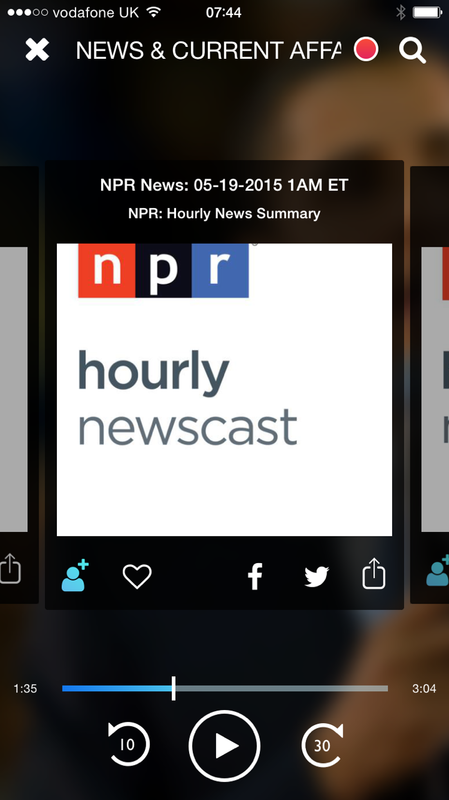 TuneIn’s iOS app has a similar feel to audioBoom. 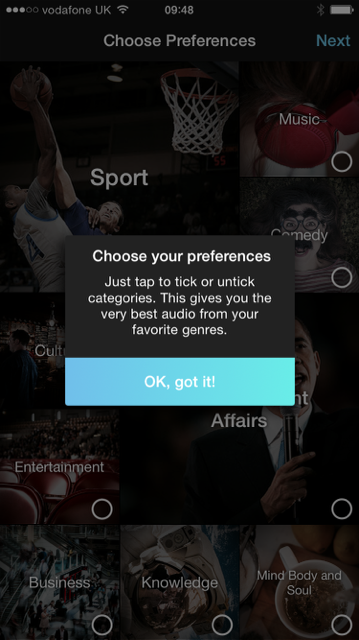 However, I feel that TuneIn currently has more to offer when it comes to audio to listen to. 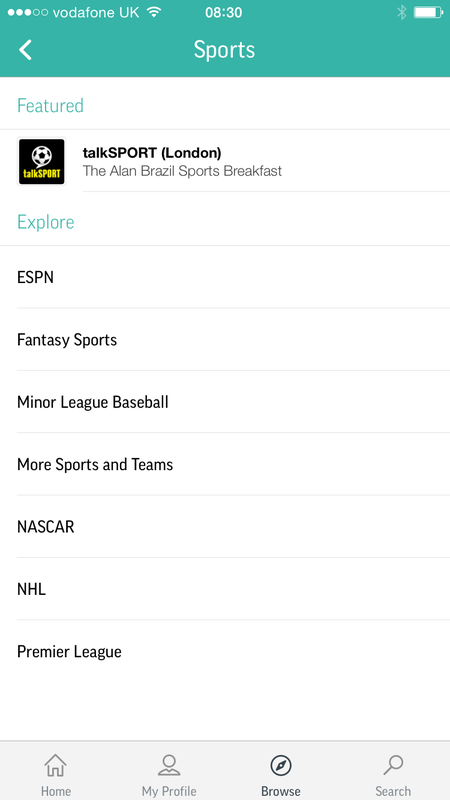 For example, in the “Sports” category there’s more content to explore than on audioBoom (see Fig. 8 below). However, from a pure design and visual perspective, audioBoom looks a lot nicer and feels like a more ‘delightful’ experience. Did the app deliver on my expectations? – Yes, easy to find and use audio content, presented in a way that feels very intuitive. The only thing I’m hoping for is that audioBoom will be able to further grow its content portfolio. This way the app will no doubt get more sophisticated in the personalised recommendations that it can provide me. How to create copy that works well for search engines?